Legal Aid of Manasota cy pres Award Presentation - Law Office of Scott Johni, P.A. It was an honor to present Legal Aid of Manasota a cy pres Award of $19,527.05 which will be used to help provide free legal services to the most vulnerable families in Sarasota and Manatee Counties. 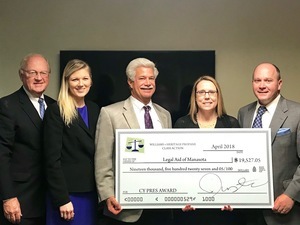 The cy pres awards were a result of unclaimed funds from a class action verdict being donated to organizations that assist families across the state in all 67 Florida counties.Pictured are attorneys Kent Whittemore and Erin Lohmiller, class representative Fred Williams, Linda Harridine of Legal Aid of Manasota, and attorney Scott Johni .